This is a site for people who love their dolls and would like to see pictures for inspiration. I'll post more photos soon! (of more duck tape crafts)!! I have found the new hobby of duck tape crafts, and have made a few different things for my dolls. I have two posts on my other site if you want to check them out. (They're the top two posts). I'm looking forward to making more things for my dolls, and am thinking of trying out the suspenders in the book I have. I think these would be a nice addition to my dolls' outfits. My new doll, Holly, has been a great addition, and her guide dog, who I've named Cocoa, is just so adorable. I've used her in one of the photo shoots that I did early in January. I hope you enjoy the new posts at the other site! If you have any Duck Tape photos you'd like me to share, send them to agpixplace@gmail.com. Happy New Year!!! 2014 is here! Happy New Year everyone!!!! I got a new doll, Holly. To read more about Holly, and to see some new changes to my website, click here. I will be posting some more, and better pictures of her soon. 2014 is a new year, and I am determined to be more involved in the doll world, and in updating my website. I am excited to be more involved again. Life has kept me busy, and high school life is busier than ever (I'd heard that junior year is the worst, and so far it has been), and I've gotten addicted to my Facebook account, and twitter. But this year, my goal is to spend more time taking pictures with my new camera, and less time on the internet (specifically Facebook). Happy New Year, and I hope you take the time to visit my "new and improved" website. Feel free to leave a comment, but due to lots of spam in the months that I had my back turned, I am going to be approving all comments before they are posted, so you will NOT see your comment right when you post it. Happy New Year! It is still the 31st of December here in Ohio, but for some parts of the world, it's been the 1st of January for a number of hours now! I know it's been a very, very long time since I've posted anything. I'm going to really try to do a better job in 2014. I have posted something on www.agpixplace.net, and I have another post coming tomorrow. 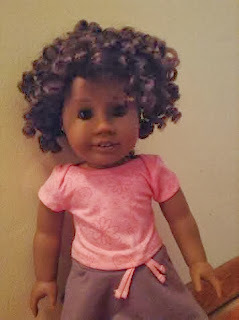 I have gotten a few American Girl items for Christmas, so as I use them, I will be sure to post them. So far, we have gotten plenty of snow here in Ohio, and I anticipate more. You might find a snow story coming your way the next time I get a snow day! But before I get a snow day, or go back to school for that matter, I would like to wish everyone a happy, healthy and fun 2014! Ok- I posted a small-ish post on my other website. I will try to post photos before the end of July! Have a great summer! IIt's spring! It doesn't feel like spring here in Ohio. It was 19 degrees this morning. I have gotten a lot of new things for my dolls. My mom made a few necklaces for my dolls as well. I should have photos up soon. I can't promise this weekend, but next week (Friday) starts our Spring Break! I should have plenty of free times, which means that I will be able to post the photos. Well, February has been busy, and it's only half way over. Our Ohio Graduation Tests are in 3 short weeks, and all sophomores in the state take them the same week. We have been busy getting ready, and that's left almost no time for anything else. Honestly, by the time I am done homework, I don't even think about taking pictures since it's pushing 7pm. When the weekend comes, I want to do what I haven't had time to do yet all week. I did manage to post some pictures of Kit's kitchen on my other site though. Give Away winner and What's wrong with this photo? Well, I'm trying to stick to my goal, that I set earlier this month. I'm not quite on time with 2 weeks, but I'm closer than I have been. This weekend, my friend, Kat, came over and we took a bunch of pictures for the website. Well, we had a lot of fun, and we decided to add something that doesn't belong in this picture. Do you know what it is? There are a lot of things, that you probably wouldn't see at a table in North America, but which item definitely is impossible to have at a table in North America?! I had Give Away last September, and I finally drew the winner. The winner is Kassidy. I have sent you an email Kassidy. If you don't want the doll sized crocheted purse and wallet, that's ok, just let me know so that I can draw another winner. I'm so happy to be back to what I enjoy. I hope to be posting more this semester, and so far, my semester hasn't been too busy... let's just hope it stays that way!! Have a great week or two. I was able to post some photos of Marisol and Rachel taking down their Christmas tree decorations here. With some careful planning, I think I can meet my goal of posting every 2 weeks. Well, with less than 6 hours until the new year, I thought it was time that I post some of my new year's resolutions. I'm not sure that I will follow through for 365 days, but I should at least start 2013 well, right? Hopefully, I can do more with my dolls. When I say "more", I don't necessarily mean have more "big" posts. I might just post one or two pictures, but that would be enough for me. 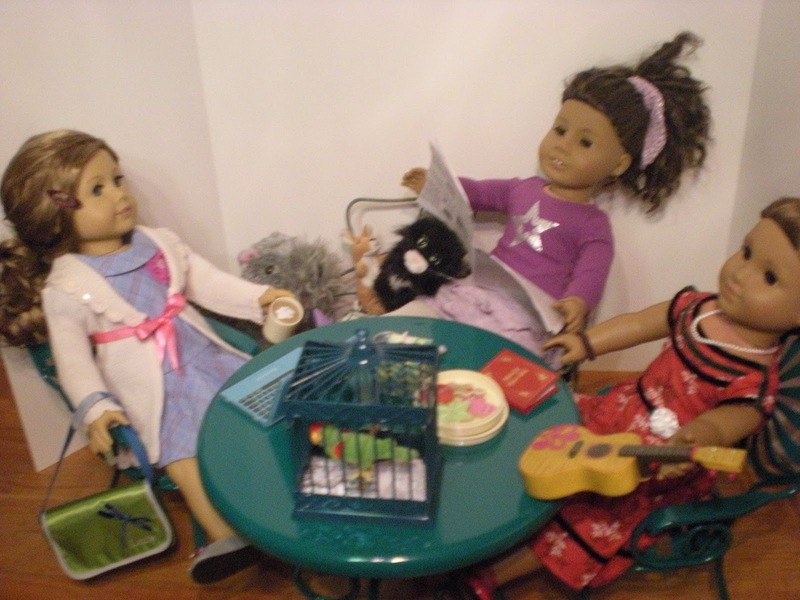 I got some new things at American Girl Place in Chicago this fall, and I haven't done anything to post any photos. Hopefully, I will at least show you the new outfits I got in a post this month (January) if nothing else. Later this year I should be able to show you some of the other stuff I got, slowly. I had a good Christmas, in case you were wondering. I visited NORAD again this year. They changed their website, and I liked the videos with narration more than I like the music videos. I got DVDs that I had asked for, and a stuffed animal, and 2 key chains for my backpack. My dolls need to take down their Christmas decorations so I will at least have a few photos for you on new year's day. I didn't take any photos of my dolls putting up decorations, but I'll take a photo of the tree before my dolls undecorate it. Hope your New Year's celebrations go well. I have had AG dolls since I was 4 and I had a MyTwinn Doll when I was 3. I have 22 American Girl Dolls, 2 Madame Alexander Friend Collection Dolls, 1 Australian Girl Doll, 4 Karito Kids, 1 Bitty Baby (American Girl), and a few other dolls that aren't "name brand". I have ~35 dolls total. Check out about me for the complete list of dolls! I am so blessed to be able to have so many dolls, a wonderful family and life. Questions? Email them to agpixplace@gmail.com. What do you think I should give Away next? Interviewing Jessie Haas on Friday, author of the Saige books! Copyright 2012: American Girl Pix Place. Simple theme. Powered by Blogger.